The base class for Hemera Qml Gui applications. 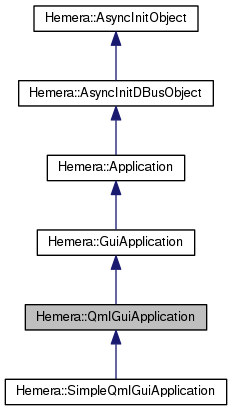 QmlGuiApplication holds all the needed logic for applications based upon Qt Quick 2. Compared to GuiApplication, it does not manage QWindow directly, but only takes a QUrl of a Qml file instead. Such a url can be also the URL of a resource or qrc resource. QmlGuiApplication should be used when you need to mix Qml and C++ logic. If you don't need C++ logic in your application, you can simply use SimpleQmlGuiApplication in your ha file, which does not require you to write any C++ code. During the initialization phase, it is possible to interact with the QML engine before any component is loaded. This allows to interact, for example, with the context before it starts taking effect. QmlGuiApplication requires your device to support a working 3D stack. Please enquire with your representative to find out if that is the case. Running a QmlGuiApplication on an unsupported device is, besides unsupported, likely not to be working.